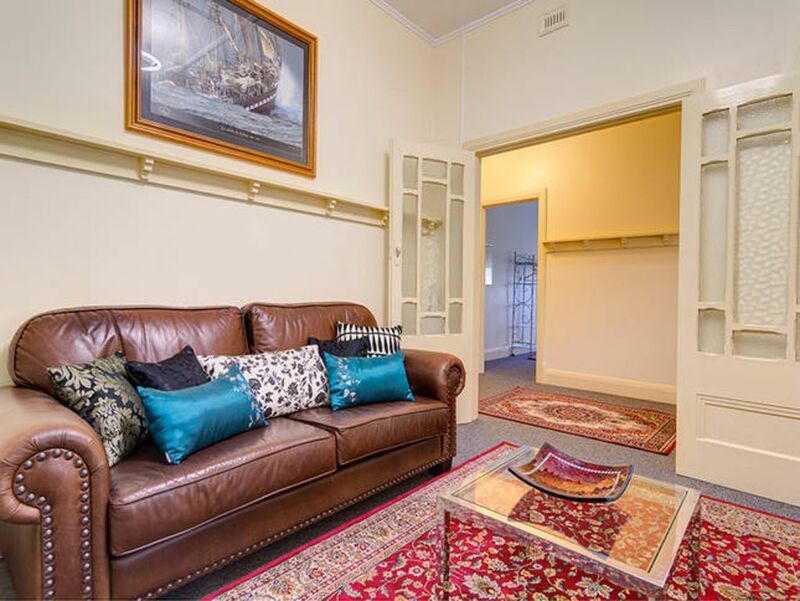 Charming 2 bedroom cottage in Glenelg. Fully furnished and equipped self contained cottage. Accommodation consists of a queen bed in bedroom 1 and 3 single beds in bedroom 2. Perfect for a large family. Request a prompt quote today! Full kitchen facilities with fridge and washing machine and clothes line. The bathroom has a full size bath and shower (over the bath) with a separate toilet. Off street parking for 1 under cover plus two more off street in the drive way and ample street parking. Included are LDC 42" tv, DVD player with discs, all linen/towels. iron, hair dryer and all detergents and soaps. Other features are air conditioning, keyless entry, non smoking and no pets. Please note, this cottage is self catered and not serviced. Toys, books, games, high chair and port-a-cot. Alf Smedley reserve directly behind the cottage, accessed via the rear gate in the garden, has a playground, under cover seating and a lawned area. The Glenelg Tram is a 500m walk, and will take you 3 stops to Glenelg Beach and Jetty Road or to Adelaide city, stopping at Rundle Mall, Adelaide Oval, Adelaide Casino and the Adelaide Entertainment Centre. The Glenelg Jetty Road shopping precinct is open 365 days per year, offering numerous pubs, cafes, restaurants and take away shops. The brand new SA Aquatic and Leisure Centre at Marion is 5km away. Hall carpet msts were curled on the edges and unsafe. Toilet and shower leaking plumbing. Yard could do with a tidy up. Very comfortable house. The only concerns were the annoying dogs next door constantly barking when their owners were out even in the night. Good location. A fantastic place to stay with a family. Not too far from the beach. Only negative was the unmown lawns. Was really looking forward to letting my 2 year old explore the backyard (as we don't have a backyard in Sydney), but sadly the grass was too high to be sure it was safe from snakes. Otherwise it was a great place to stay. Beautiful, clean and great location! Value for money. This is the second time that we have stayed at Keen Kottage and we were very happy with the service provided by Louise and the house which was perfect for our needs. The location is excellent and the house is big enough to sleep 5 comfortably. The beds are comfy and linen is great, and the couches are great for both younger and older people (easy to stand up from!). The shower is in the bath, (which didn't bother us), but if you were travelling with someone who had mobility issues this might be an issue for you. Fantastic value for money and we will be back again and again! House was fine. Very strong cigarette smoke smell from neighbours. Lovely cottage, had all we needed. Close to just about everything ! Comfortable beds and plenty of space for a two bedroom cottage.